Experience the glamorous luxury of the Crystal Yachting Lifestyle on a journey granting privileged access to exclusive resorts in Anguilla’s Rendezvous Bay and Nevis’ Pinney’s Beach, and indulgent experiences from St. Barts to St. Kitts. A choice of two complimentary Crystal Adventures offers: one is cultural exploration and the other is active adventure. 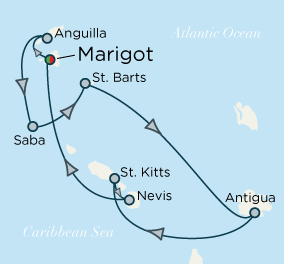 St. Barts forms part of the French Overseas Region of Guadeloupe. Descendants of settlers from Brittany and Normandy operate its tiny inns, shops and restaurants. This charming, slow-paced island attracts tourists year-round to its shores. The graceful meadows surrounded by low stone fences, spectacular beaches, the small volcanic mountains and the quaint Creole-style villages are just several of the alluring aspects of this tranquil island. A slice of jolly old England in the Caribbean, the former British colony of Antigua (An-tee-gah) is steeped in English tradition, stirred in with local color. Hues range from sugar-white sands and startling blue waters to red-roofed buildings and sweet-pink blooms. More than a pretty picture, Antigua served as an important British naval port, the vestiges of which remain at Nelson’s Dockyard, a cultural heritage site located here on the south side of the island near English Harbor. The only strategic maneuver you might want to make during your island visit is staking out a prime spot on one of Antigua and Barbuda’s 365 beaches – one for every day of the year. Although discovered by Christopher Columbus in 1493, St. Kitts was settled by the British and the French more than a century later. Known as the Mother Colony of the West Indies, today the island is an independent nation. British influences abound in Basse-Terre, the capital of St. Kitts. Featured here is the domed Treasury Building, now a national museum, the Circus, which was modeled after Piccadilly in London, and the St. George's Anglican Church. Christened Notre Dame in 1670 by the French, the church was destroyed four times before it adopted its present Georgian-style structure in 1869. Its graveyard, however, boasts stones dating back to the early 18th century. Explore the traditional white-sand beaches on the southeast peninsula, or admire breathtaking views of verdant mountains, expansive sugar cane fields and exotic gardens from the interior. A singularly divine destination in the two-island nation of Sant Kitts and Nevis is Coconut Grove Restaurant & Wine Lounge, aptly named on all counts. “Coconut Grove” for the coconut trees that surround it; “Restaurant” for the delectable dishes created by Culinary Institute of America graduate and dietician, Chef Stephen Smith; and “Wine Lounge” for the stupendous variety and quality of wines offered from its wine cellar, the only awarded wine cache on the island. The official count ranges from 4,000 to 8,000 bottles, but no matter: fine vintages pair brilliantly with Franco-Caribbean fusion cuisine. On par with the menu is the setting, elegant South Seas with rustic timbers, thatched roof and colorful textiles. Outside are an infinity pool and views across the two-mile “The Narrows” channel to sister island, Saint Kitts. Elsewhere on the island, luxuriant rainforest, old sugar plantations, volcanic hot springs and the nine-mile Upper Round Road, perfect for mountain biking, encourage both active and relaxing pursuits. Saint Kitts has a tale of two Friars: The first is South Friars Bay, situated on the calm waters of the Caribbean. The second is North Friars Bay, positioned on the more rugged, Atlantic side of the island, directly across the narrow Southeast Peninsula that divides the two oceans. With warm, clear waters and a fine beach, South Friars Bay is an ideal spot for snorkeling and swimming. Food stands and lively bars satisfy cravings for a tasty snack and beverage, while commonly present palapas offer a shaded place to relax. One of the most photogenic stretches of sand in the West Indies, this four-mile expanse often graces the pages of travel magazines enticing savvy globetrotters to follow the sunshine. It is the longest beach on Nevis, which affords visitors plenty of varied vantage points to enjoy along the horizon. Dive into the crystalline waters for any number of aquatic adventures, or simply bask in the warm rays of the sun favored by discerning travelers from around the world. Nestled pristinely along Pinney’s Beach is the Four Seasons Nevis Resort, replete with a challenging 18-hole golf course, spa and pool – all of which provide a tropical oasis amidst this island haven. Crystal’s exclusive partnership with the resort offers guests the opportunity to indulge in the onsite amenities, or simply relish the sweeping views of ocean, rainforest and powder-soft sand. 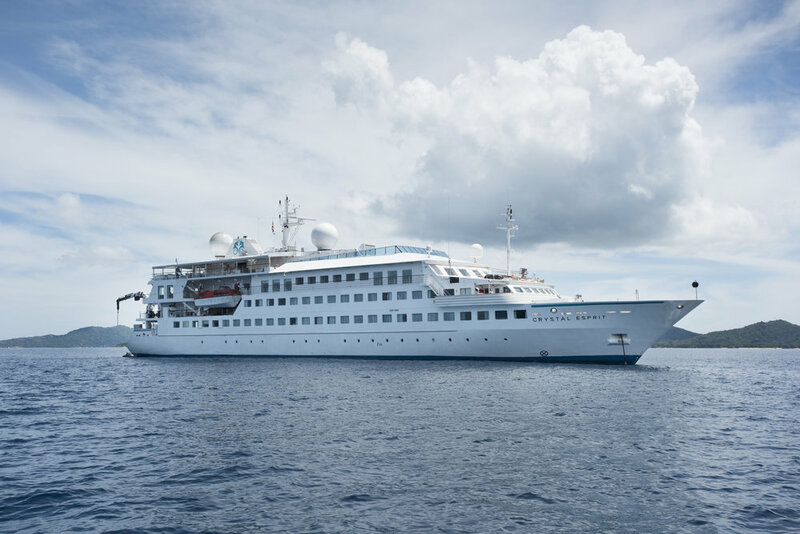 The Crystal Esprit offers an intimate and elegant enclave while welcoming just 62 sophisticated adventurists in all-suite, butler-serviced accommodations. The yacht's unique size brings guests to the very doorstep of some of the world's most exclusive shores, allowing for incomparable personalized experiences. Imaginative cuisine of Michelin-level envy. Lavish culinary presentations inspired by the flavors of lands explored. Classic specialties and innovative tasting menus. Crystal Esprit's dining experience is savored in casually elegant, open-seating venues designed to celebrate food, wine and conversation. *All fares and savings are per person, in U.S. dollars based on double occupancy. Cruise Fares and Your Exclusive Fares are cruise only and do not include taxes, fees, and port charges of $280 per person. Your Crystal Savings are subject to availability at time of booking. Your Exclusive Fare includes Crystal Savings as well as applicable Early Booking Savings if available and does not include Crystal Society or Early Full Payment savings. Optional Personal Select Air Program is available to purchase for full-fare, full-cruise guests whose travel originates from a U.S. or Canadian airport and includes all government taxes and fees. Note: Early Full Payment savings do not apply to Personal select Air. Solo Traveler fares are available upon request. Crystal Society Savings are per person based on double occupancy. All offers may not be combinable with other promotions, apply to first two full-fare guests in stateroom or suite, are capacity controlled, subject to availability and maybe withdrawn or changed at any time without notice. **Applies to new bookings only.